The parameters of rock music were set one day in May 1955, when Chuck Berry recorded his debut single “Maybellene”. Chuck Berry was the rock’n’roll pioneer who turned the electric guitar into the main instrument of rock music. Every riff and solo played by rock guitarists over the last 60 years contains DNA that can be traced right back to Chuck Berry. The Rolling Stones, The Beatles and a million other groups began to learn their craft by playing Chuck Berry songs. Chuck Berry is also a superb songwriter. In the course of three minutes he conjures up an image of the everyday life and dreams of a teenager, often with the focus on cars. Chuck Berry, born in 1926, was the first to drive up onto the highway and announce that we are born to run. The director Peter Sellars is a living definition of what the Polar Music Prize is all about: highlighting the music and presenting it in a new context. With his controversial productions of opera and theatre, Peter Sellars has depicted everything from war and famine to religion and globalisation. Sellars has set Mozart in the luxury of Trump Tower and in the drug trade of Spanish Harlem, turned Nixon’s visit to China into opera and set Kafka’s obsession with home cleanliness to music. Peter Sellars shows us that classical music is not about dusty sheet music and metronomic precision, but that classical music, with its violent power and complexity, has fundamentally always been and will continue to be a way of reflecting and depicting the world. ST. LOUIS (AP) — Roll over Beethoven — Chuck Berry's house earns national recognition. The modest one-story red-brick house in St. Louis where the rock 'n' roll pioneer lived for eight years in the 1950s has been added to the National Register of Historic Places, city officials confirmed Monday. The listing is somewhat unusual because Berry is still alive, still making music. In fact, the 82-year-old singer performed at the popular St. Louis-area night spot The Pageant Saturday night — a day after the home was added to the register. "It's an honor to be selected for this during my lifetime," Berry said in a statement. "Many of my favorite songs came about while in that house. It's good to know that my music and now that house will always be a part of St. Louis' history." Berry now lives in Wentzville, Mo., about 40 miles west of St. Louis. Berry and his wife bought the house in the city's Ville neighborhood in 1950, and lived there until 1958, when the family moved to a larger home, also in St. Louis. It was in the house that he refined his guitar style and wrote and rehearsed many of his classic songs — Maybellene, Johnny B. Goode, Roll Over Beethoven and Sweet Little Sixteen among them. "This is where he and his band really started playing," said Lindsey Derrington of the Landmarks Association of St. Louis, who wrote the nomination to the National Register. "It's where he wrote the important songs and just really defined his style." Joe Edwards, who owns The Pageant, noted that the Saturday night show was sold out. So was Berry's performance last Wednesday at Blueberry Hill, another nightclub owned by Edwards. "He's probably the greatest ambassador for St. Louis worldwide as far as how he's affected popular culture and the influence he's had on people like the Rolling Stones, the Beatles, Bruce Springsteen," Edwards said. The impact of inclusion on the National Register isn't really clear, but it could make the house at 3137 Whittier St. eligible for certain tax credits. "It's great for St. Louis to have a house that will be preserved in a wonderful African-American neighborhood," Edwards said. "Hopefully it might spur interest in revitalizing the neighborhood." 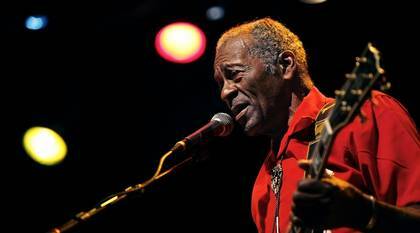 November 18, 2007, me and my daughter have been to the Chuck Berry gig in Tilburg, the Netherlands. The gig was awsome. Chuck is still rockin' our socks off and he even did a duckwalk on stage!!! "Johnny B. GOOOOOOOOOOOOD" was fantastic and his daughter plays the mouth organ very well. "Nadine", "Carol", "My Ding-A-Ling". LOL! Great evening to remember. 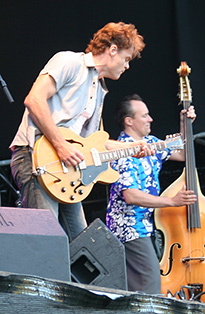 I can't tell you how much of a treat it was to see Chuck and the band at Cranford MusicFest on Saturday, Sep 15, 2007. My ears are still ringing because I had to be so close to the stage to see him and the band, but its worth it!!! It was an honor to be there. I will treasure it forever. Come back to NJ soon. 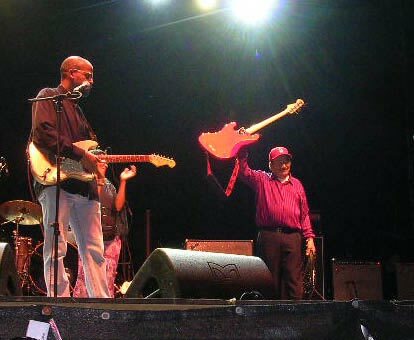 Charles Berry Jr and Jim Marsala in Berlin 2007.